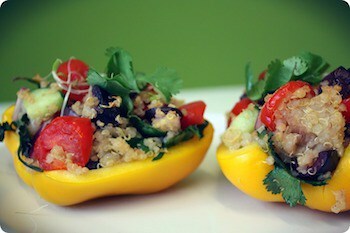 quinoa sOne of the most popular vegetables is…peppers! The main ingredient of this stuffed pepper dish is the bell pepper, which has a crunchy texture and is naturally sweet. Stuffed peppers are a fun and easy meal because you can pretty much put anything you want in them and they will turn out great! Also, bell peppers contain a high amount of Vitamin C.
*Did you know each color of pepper is associated with a different family of phytochemicals? 1 cup of bell peppers has 156% of daily recommended Vitamin C intake. Bring 2 cups of water to a boil and add quinoa, stirring occasionally until fluffy (about 20 minutes). Cut the tops off of your peppers and scrape inside clean. Place peppers on a tray and into the oven (20 minutes). Saute onion, mushrooms, garlic and olive oil in a pan. Add chickpeas, olives, quinoa, marinara sauce, Italian seasoning, and salt and pepper. Take out peppers and stuff with mixture. Put peppers back in the oven for 10 minutes.